"You HAVE to learn your math facts!"? 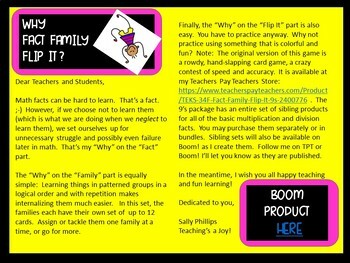 A session or two's practice with Fact Family Flip It! 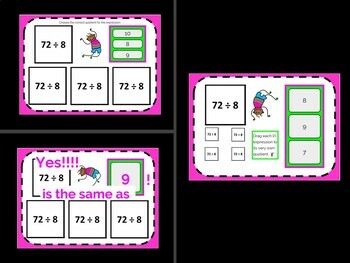 is sure to help your students internalize their basic multiplication and division facts and increase their fact fluency. 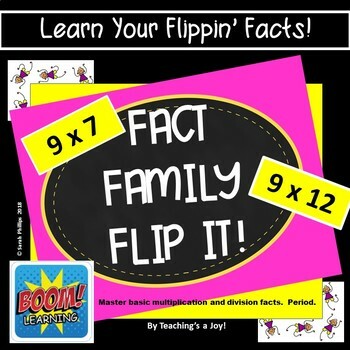 Fact Family Flip It! appeals to visual and kinesthetic learners. If students are trained to say the facts aloud to themselves on the drag and drop cards, the product will also appeal to auditory learners, and, frankly, it will be hard for them NOT to learn these facts. 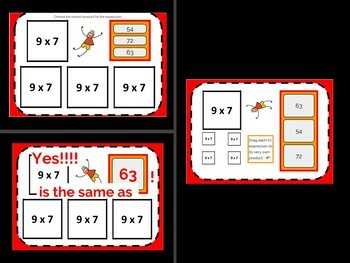 Kit includes 66 cards with multiple "touches" on each fact "ball", multiplication and division fact families 9 x 7 to 9 x 12. Watch for the 8s to come out soon! Note that this is the digital--no print, copy, cut, collate--version of games by the same name for sale in my Teachers Pay Teachers store. Used extensively with my own students, I found the card game version to be very successful. Remember: At Teaching's a Joy, the first dozen downloads are free! Follow me and be notified as new products are posted; it could pay off! Additionally, be among the first 10 followers to email me a ratings screenshot of a product, and receive any unbundled item in my store for free. Don't worry: I neither know how to--nor wish to--collect data on you, and I hate spam, too.